The final quarter of babies' first year brings significant changes: your baby crawls all over the house, climbs onto furniture, stands up, opens and closes drawers, tosses objects and is basically into everything, everywhere. These skills afford babies with ample opportunity to appreciate the world from many different angles: prone, sitting and standing. Along with mastered control over the body, babies' agility encourages a curiosity and triggers almost insatiable energy to touch, reach and explore. Watching over – and guiding – your baby at this stage becomes way more complex – and exhausting! On the one hand, it is important to allow babies to experience the world on their own terms, which is a welcome step toward independence and self-confidence. On the other hand, danger seems to lurk everywhere your baby wants to go! While this newfound independence is a giant leap, babies at this age still lack practical experience, so you cannot rely on their good judgment to recognize – let alone, avoid – danger. Rather than instigating insecurity by constantly stopping your busy bee from exploring, teach your baby how to be aware of danger, while allowing stimulation and opportunity to explore. 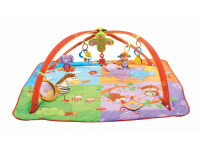 Crawls in some fashion or another and moves toward desired objects or toys. May begin to to move from crawling on his tummy to crawling on his hands and knees. Can now move from sitting to crawling and may be able to pull himself upright to a standing position. May now begin to sit upright independently, although this can happen as early as eight months or as late as twelve, and move from sitting to lying down and vice versa. "Cruises" - stands and walks while holding on to furniture or maybe even stands for a second or two without leaning on anything. May begin to walk with help or on his own. 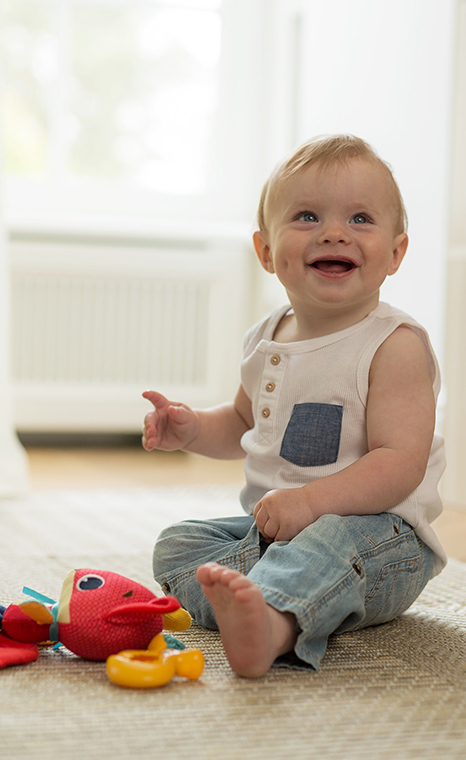 Dress your baby in comfortable, unrestrictive clothing so it is easier to practice and perfect crawling techniques and other motor activities. If possible, do without socks, or if necessary, dress your baby in very thin socks. This helps him integrate the soles of his feet and toes in the crawling process. Give your baby wide-open spaces to practice crawling, free from dangerous obstacles. 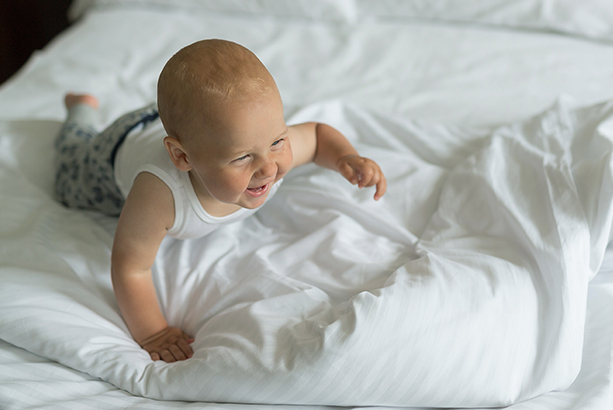 Spread pillows on the floor, to encourage your baby to climb over them, helping him progress to crawling on his hands and knees. 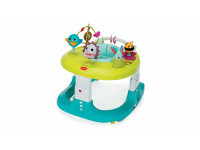 Place toys on a low table, encouraging the baby to stand and use his hands to play with the toy. 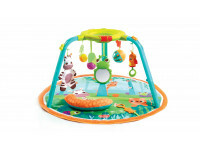 This helps develop balance and prepares him for walking. Sitting enables your baby a new perspective of her environment. It also frees both of her hands, so they are available for exploring and investigating. Most babies can sit up on their own at nine to ten months, although some can do it as early as eight months, while others – not before twelve months of age. Playtime is not only a whole lot of fun for parent and baby, it is a time when baby learns, grows and develops through exploration, interaction and bonding. Read full article to learn about how to make playtime more meaningful and get tips on creative ways of playing with baby's toys.